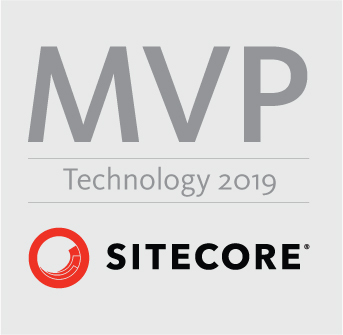 Sitecore has done a great job but abstracting a lot and marking a lot of methods as Virtual, take the Datbase class for instance it is now abstract class, and implement in the DefaultDatabase Also all methods in the Item class is now marked virtual. I must say I think It is great way Sitcore is heading, and they are doing great but allowing developers easly testing the code by taking the framework in this direction. Ok, but before I could also test using Microsoft Fakes, yes and there is Sitecore FakeDB, and also there was the old Framework I created myself Sitecore.Fakes, which didn’t work with sitecore 7+ because the Database contructer was made internal, but now working again in 8.2, the latter two Framworks (Sitecore FAkeDB and Sitecore.Fakes) required additional setup in a App.config along with a license file in your Test project With the changes mention before this is no longer required .. I’ve updated the Sitecore.Fakes found here https://github.com/istern/Sitecore-Fakes the solution contains examples of how to test with this Framework, a simple example is given below. Note I’ve trimmed the framework a lot, ie. removed functionality that will be rewritten., so it is no longer as feature rich as before but now working J, also it is by fare not as feature rich as Sitecore FakeDB. Recently I had to write some code that import a lot of content for a customer, who on a daily basis wanted to imported 100+ news Items into Sitecore. Importing and filling out the data field of items isn’t that complex task, or code to write. But I really wanted to test the functionality so I could guarantee and verify the behavior of my code before I released into a running LIVE environment. So I’ve sat myself the goal to extend Sitecore Fakes so I could test against and “Database” in memory instead of cleaning the Sitecore solution every time I’ve ran a test import. With these change in place we can now run our test from the beginning. If you need more then one database or another then “web” which is default for Sitecore Fakes either alter or add one more to the DataBase section of your test project so it look like something like below. in this post I will give a simple guide that can get you started on using Sitecore Fakes. So you can start doing unit testing with Sitecore. You can use Sitecore fakes with any testing framework for example Nunit Xunit o any like those. 2. Once you have downloaded the code start it up in Visual Studio, and fix the missing reference for the Sitecore.Kernel.dll see image below, and then build the project. If the test project fails you can, if you like, fix the missing references for Sitecore.Kernel and Sitecore.Nexus all other references can be updated through nuget. But it is not required to get Sitecore.Fakes to work. 3. Now open the solution that holds the code you want to test and add a new “class library” to the solution. To the newly created project you will need to add an app.config file and a references off course to the Sitecore .Fakes.dll you just build in step 2. The App.config filles is ONLY REQUIRED if you need to access anything else but the the “Item.Fields” for example the database child colletion and so on. The content for the app.config you can copy in from test project that Sitecore Fakes comes with and has on Github, but as a service i will give it here. 4. Next add a reference to Sitecore kernel and Sitecore Nexus in the newly created class. Sitecore Fakes Media Items LinkFields and a challange. When I first started building the Sitecore Fakes Isolation framework I was given a challenge by Per Bering. The challenge was to make the following unit test pass. Passing this test would require for implementation of some more fake objects in existing Sitecore Fakes Framework, a implementation for easily adding LinkField XML to an field “General Link Field in this case” , make the mapping to the TargetItem And create it. Creating a fake media Item, and replacing the default Media Provider used by the MediaManager. The Fake Intenal Link Field, builds the XML required for casting in to the real LinkField, so it derives from a FakeField which build the XML allmost like Sitecore Does it. Here is the FakeField and FakeLinkField no getters is placed on the FakeLinkField since I expected values to be fetch through the regular LinkField. When adding the FakeLinkField to an field on a FakeItem simply call the .ToString() and build the XML for a regular LinkField from Sitecore. See Example below. With that in place the inner part of challenges is now passing. Next was the TypeCast to a MedaiItem, again creating a FAkeMedia Item ad mapping all the field passed in all most does the job. BUT sitecore asks for field values using their names so an additional mapping from id to field named is required, Sitecore Fakes now mappes most of the standard field on an imageItem from Sitecore using the MediaField setting file se both below. Since this is a first release and to make the test pass with out writting to much code I’m gonna give the premise that and media url is build from the item name and the type extesion , prefixed with “/~/media library/”. Here is is rather simple implementation of the Fake Media Provider. 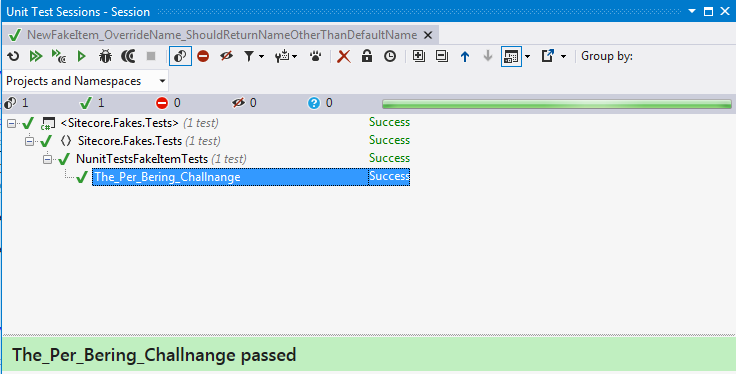 And Now Lets See the “unit test” / challenge pass. Remember unlike other Sitecore unit testing examples this is all done i memory. So this is pure unit testing no integration testing. And hopefully Sitecore Fakes will develope over timer to support more features. Let me know which feature I should work on next. 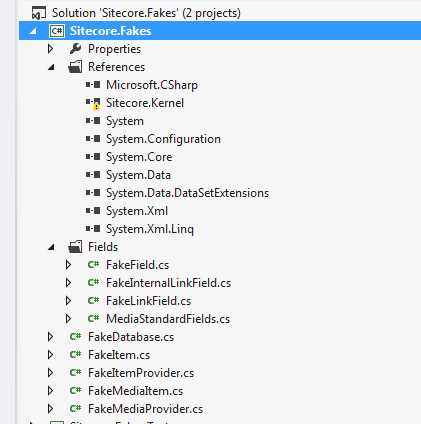 Mocking Sitecore recently became a lot easier with Microsoft Fakes in Vs 2012 update 2 or by using Typemock. Lately I’ve started using NCrunh and yes it might be a bit overpriced but it is worth every penny, at least for me. I know Typmock work with NCrunch but that comes with an even larger price tag, and unfortunately Microsoft fakes doesn’t work “yet” with NCrunch, so I’m back to my Sitecore Test Item Orginal Post. 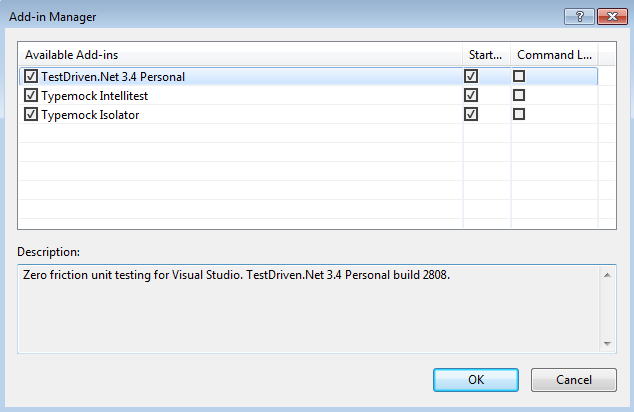 Earlier I showed how to stub out field data with the sitecore test item. With the test item you can cover the most basic data transfer stuff from Sitecore through the field collection. But I really wanted to do more complex testing without talking to the database or doing integrationtest. Mike Edwards showed a solution where you copy sections from the web.config to a local app.config in your test project. By doing that you are doing more integration testing then unit ttestin. So i wanted to find out how little you should copy from the web.config to make Sitecore test item now “FakeItem” extend more Sitecore functionality, for example Item.Children. Now the problem is when asking for the ChildList through the Children Property you end up deep down in a provider instantiate by the ItemManager. The default provider for some reason requires a valid licens. But with a valid license file now in place, what is next? Why not replace the default Provider for the itemManager with a fake one, where we can control what to return for different calls to the Provider through the ItemManager. And my i present the new FakeItemProvider. 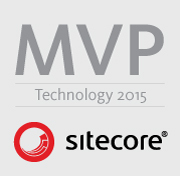 And luckily Sitecore finally found good use of virtual methods. The fake itemprovider depend on the FakeItem which I have extended a bit so it is possible to add children and parents to an item. Off course this should be extended even more to support more Sitecore functionality. An example that shows the childList and parent stub in action. The code for this is free to download and can be found on GitHub Sitecore.Fakes. Let me know what the next thing you like to get stubbed should be ! Typemocks Isolator has been around for quite some time now, and I was given the opportunity to review version 7.4 of the product. Isolator is best known for the ability to test legacy code, i.e. code that with other mocking frameworks isn’t possible to mock or stub. Typemock ships the Isolator package with a lot more features than the ordinary mocking framework. Short list given below. I will consider each of these in this review. The smart runner allows for tests to be run when building your solution. At startup it examines all your current tests to get a baseline, and from that it should in for this session when rebuilding only run test relevant for the changes made. It sounds smart but In this context, I would rather use something like NCrunch. The good news is that NCrunch has support for Typemock Isolator. Maybe for larger application this would be a nice feature, especially if running the entire battery of tests takes more time than building your application. The coverage analyzer part is nice touch where you can hook up with your favorite test coverage analyzer for example DotCover or NCover. But, and this is a big but, for me with the test runner included with Typemock I simply can’t find a window or output which shows the entire test coverage for my application, not even for a single class. Maybe I’m missing something. But all I can see on each methods in each class. See images below. As with any mocking framework, e.g. Nsubstitute, Rhino, Moq, you can with the Isolator mock virtual methods, interfaces and abstract classes and methods. In addition, it is possible to mock statics-, private- methods and classes which cannot be mocked with standard mocking frameworks. As promised you can mock everything with Isolator. I previously wrote a blog post where I stubbed out a lot of Sitecore functionality. You can read the blog post [Mocking Sitecore with Typemock Isolator Here]. The intellisense for autocompletion for fakes is one of the features which quickly became one of my favorite things about Isolator. This feature really speeds up the process of writing tests. 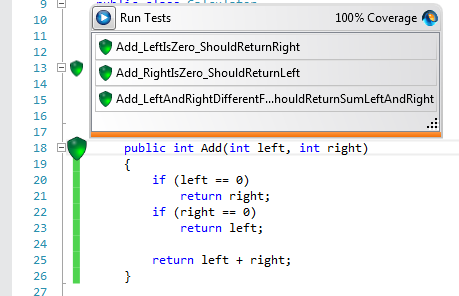 Instead of writing Arrange part of a unit test, it automatically generates it for you using the shortcut “alt+7” . Test Code Autocompletion – Really liking this one. With the Isolator from Typemock you get much more than a standard mocking framework, you get a feature rich add-in for Visual Studio. 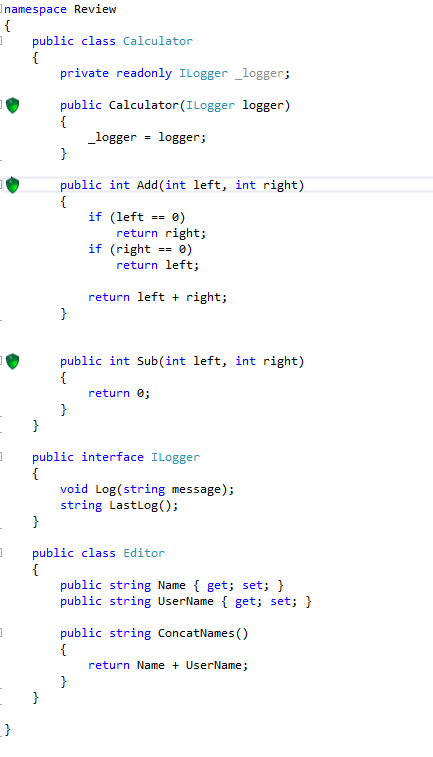 For those only looking for an Isolation framework, this might be a bit too much. But if you are working in an organization with a lot of “Legacy Code” or trying to introduce unit testing or even TDD, I think the Isolator will offer you some really good assistance. It comes with a price tag but you also get a lot more than a standard isolation framework. For me working with Sitecore I need something like Isolator where you can mock/stub everything. But there are other alternatives out there for example Microsoft Fakes or JustMock, with Fakes coming free with Update 2 for Visual Studio, fakes syntax isn’t as intuitive as Typemocks Isolator.. If you are interested Typemock offers a lot of really good webinars. You can find a list of previous webinars [here]. Also if you follow them on twitter @Typemock you can be notified about upcoming webinars. With these webinars you can get a good introduction to unit testing and TDD, and how to introduce Testing into to your organization.